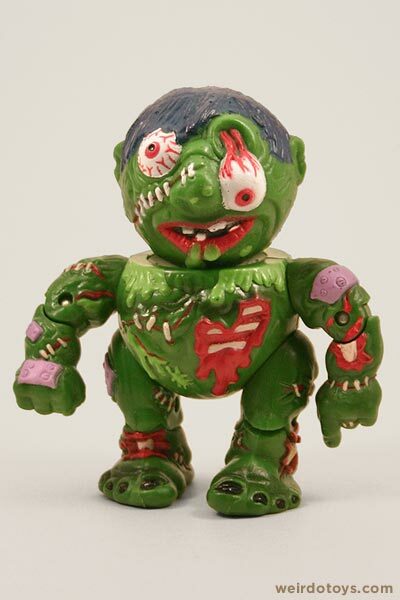 So, it all started around November of last year when I was writing my Anniversary Madballs post. While searching online for various tidbits about the origins of Madballs, I came across a bunch of Madballs paraphernalia and other toy images, but I was quickly overcome with excitement when I discovered these guys. They look like awesome little Madballs action figures… and upon further reading, I soon confirmed that they are Madballs Head-Popping Action Figures released in 1986 by AmToy. 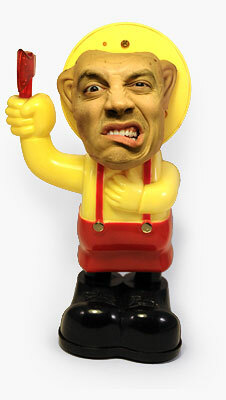 These 4 inch figures have spring-loaded heads/necks. With the flick of a trigger on their backs, their heads go flying. They look this cool AND their heads pop off? Wow!! Ya know, these may be the only worthwhile spin-offs of the Madballs brand. I don’t really remember seeing these things as a kid. I just had a couple of the original Madballs. 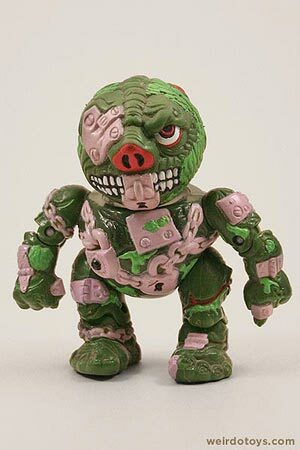 I never took it to the extreme of wanting any of the spinoff toys and other random Madballs products (luckily for my parents). It only took one look at them, and now that I had discovered these things, my obsession began. 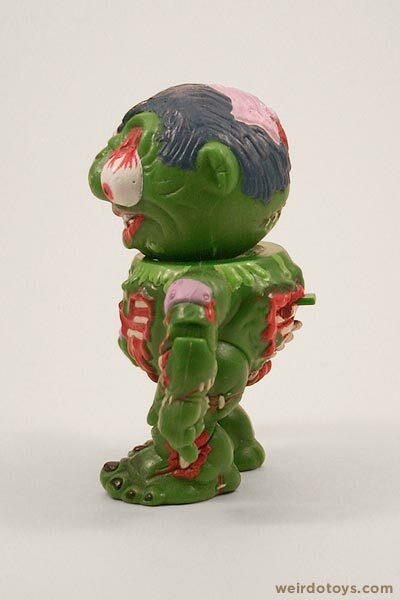 Not only do they encompass the great “grossness” of the original Madballs, but they’ve been taken a conceptual step further – these heads now have bodies which further illustrate their unique personalities (and maybe a hint at their origins). 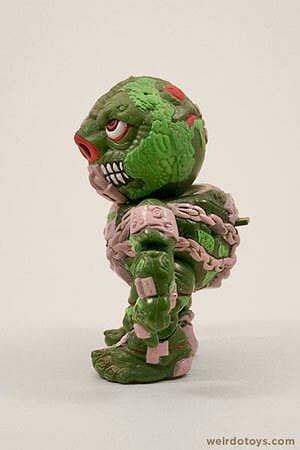 As I searched online and at various toy shows, I soon discovered that these things are fairly hard to come by… especially if you want any of the Madballs figures with its corresponding head. 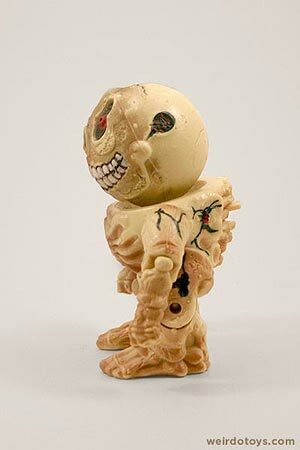 And not only that, but most of the old ones I found have major paint flaking, damaged necks and broken triggers, so the heads wouldn’t stay attached or even launch anymore. Well, as you can see, my patience and persistence (with the help of eBay) have prevailed. I am now the proud owner of a complete set of the ever-elusive Madballs Head-Poppers. They’re not all in perfect shape, but I still love ’em all the same. Let’s meet the gang, shall we? Wolf Breath – The original dog face, this guy’s breath could stop a clock! 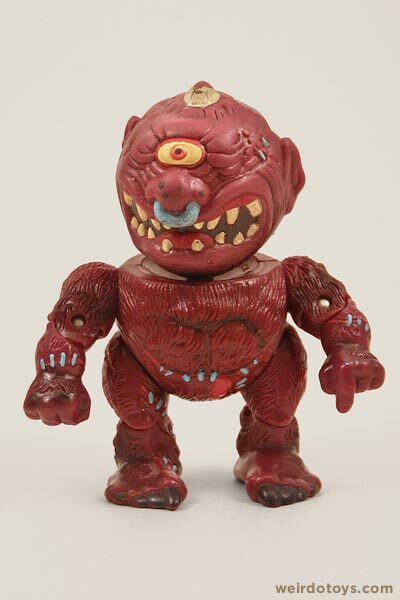 Slobulus – A gruesome drooler with one eye dangling for gross fun! 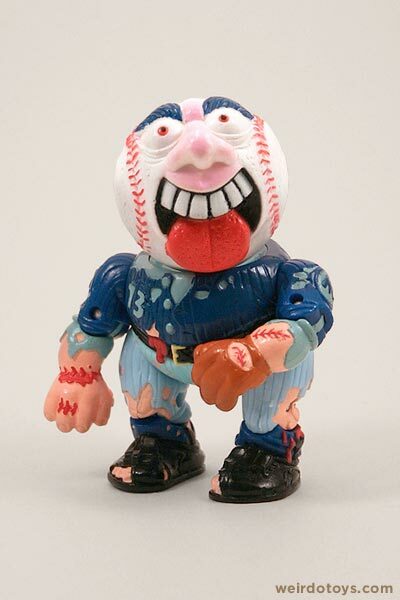 Screamin’ Meemie – A crazy baseball with a ghastly grin! Dust Brain – A dried up mummy head who’s not too tightly wrapped! Lock Lips – A creepy creature with locked-lipped feature! Bruise Brother – A real tough cookie who’s a regular crumb! Horn Head – A one-horned cyclops with a ring through his nose! Skull Face – A mask of bone, teeth and frightening delight! 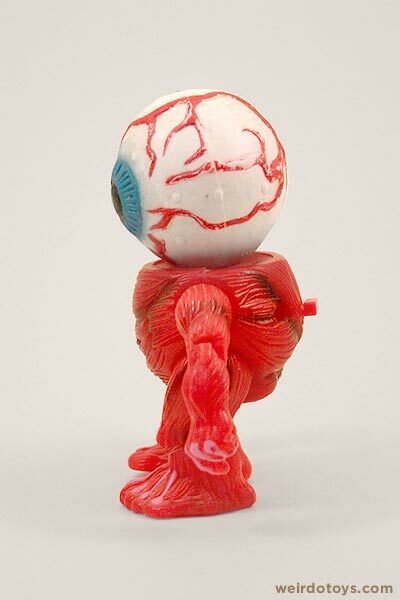 Oculus Orbus – A big, bloodshot eyeball to freak out your friends! It’s great seeing the cartoony grossness of this set. I think the modern politically-correct children’s toys makers would never have allowed these “cute” kids toys to have open, bloody wounds or torn flesh with exposed rib cages and spines. That’s just genuine, vintage 8os grossness. MMM-mm. So, I have a goofy story to share. 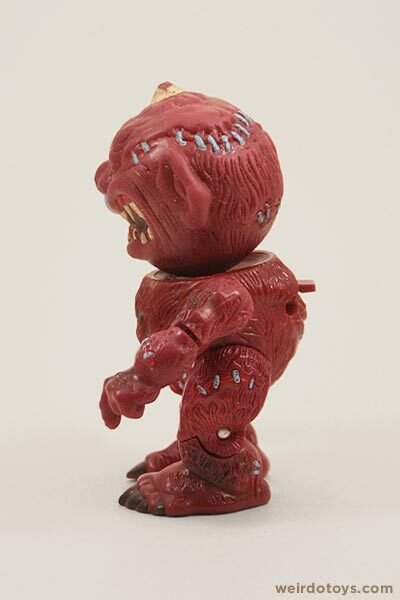 As as I searched and slowly gathered the Mini Madballs figures, I soon discovered the “holy grail” of the set – Horn Head. Apparently he was an exclusive figure that was included with the Mad Rollercycle. 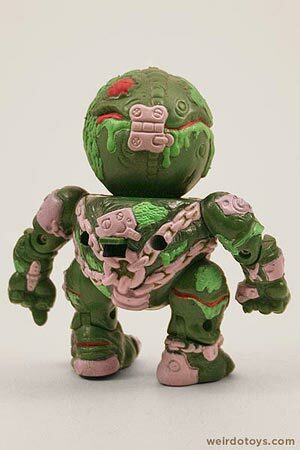 You thought finding good Madballs figures was a challenge? 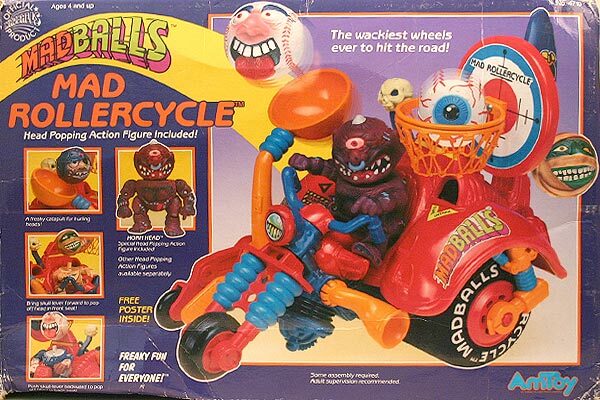 Try finding a Mad Rollercycle complete with a Horn Head figure. The Rollercycle is usually by itself or comes along with a headless or “wrong-headed” Horn Head. 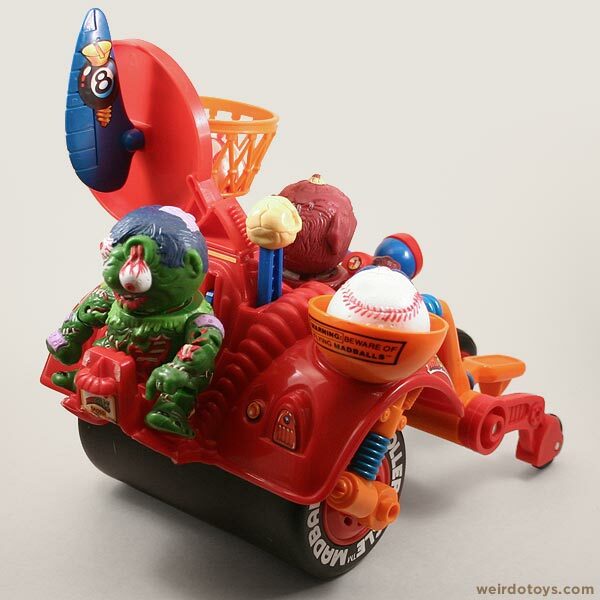 Well, just a few weeks ago after some super-laborious web-searching, I came across a Dutch website where a seller was actually offering a Rollercycle with Horn Head. What luck! But wait. There was only one problem. I couldn’t understand a single word on the website. Luckily, with the help of Babelfish Translator, I quickly had the site translated. It was broken English for sure, but it did allow me to at least locate the appropriate links to contact the seller. So, being the desperate man that I am, I composed a message to the seller, asking how much the toy is and all that jazz. Now remember, the site was Dutch, so chances are I’ll have to make contact writing in Dutch… and that’s exactly what I did. I translated my message hoping whoever read it could make enough sense of what I’m sure was a horrible translation. I also made sure I attached my original English message (you know. .. just in case). With luck on my side, the seller wrote back. He was in Belgium and could understand English (YAY! 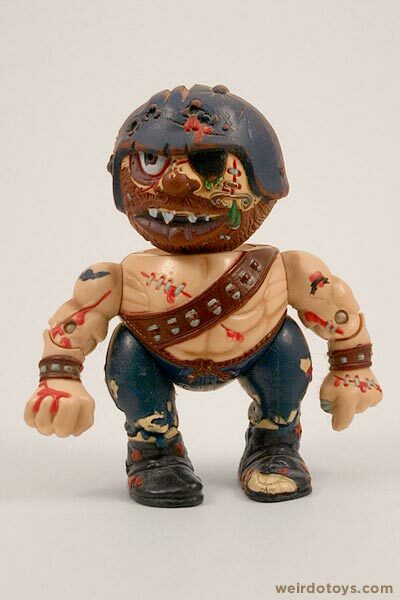 ), and he still had the toy available for me to order (YAY!x2). So, here it is in all of it’s ugly-clunky glory. 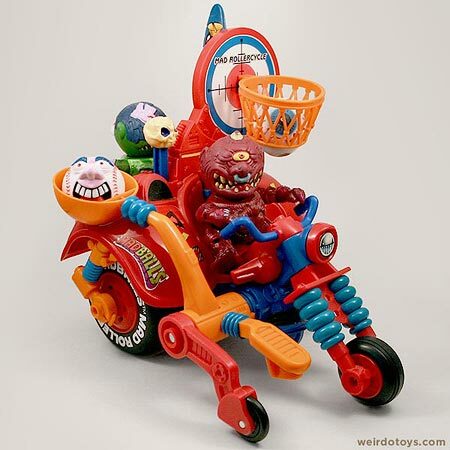 The Mad Rollercycle is basically a motorcycle-steamroller combo. It comes equipped with a catapult to launch the various Madballs mini-figures’ heads. There’s also a basketball goal if you feel like shooting a few Madhoops. Last but not least, there’s the little skull-topped gear shifter. 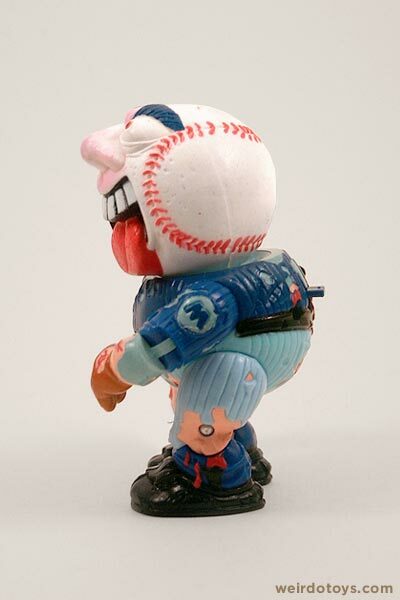 Pushing it forward or backward activates a small mechanism in the backs of both seats which presses the triggers on the backs of the Madball figures – sending their heads flying. Honestly, the whole thing seems like a half-hearted attempt ot just make more money on a crappy, arbitrary Madballs vehicle. Even on the packaging, you can see they slightly attempted to create a story for these guys. 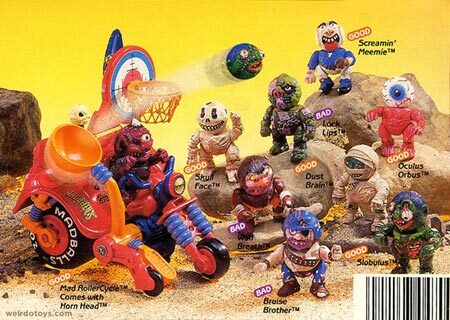 They’ve even been specified as GOODBALLS and BADBALLS (I’m telling you, it feels good to know a skeleton and a mutilated, rotting-flesh zombie are a couple of good guys). 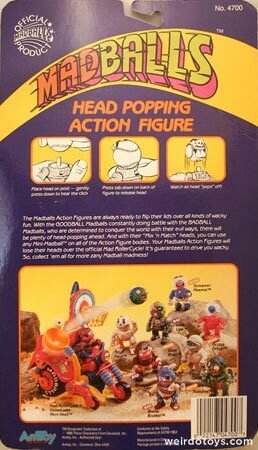 Just a side note: Doesn’t the figure on the Mad Rollercycle box look a lot different than the actual Horn Head toy? 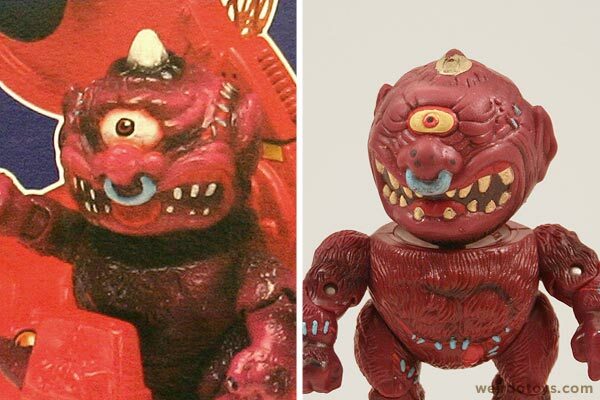 I’m glad the toy didn’t turn out to look like the prototype. You think everything you just saw was cool? You aint seen nothin’ yet. 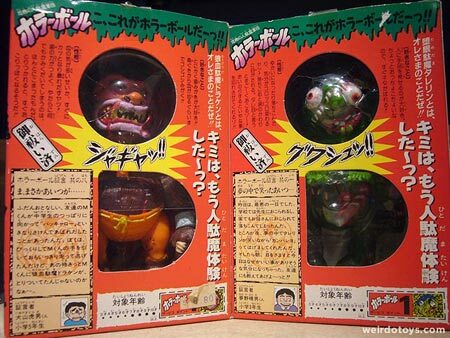 Imagine the coolness of these figures…. 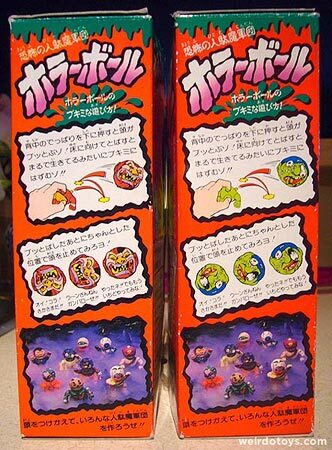 Now imagine the coolness of these figures packaged in Japanese, super-unbelievably-awesome, super-well-illustrated-and-designed re-closeable boxes. Did they look something like this?? 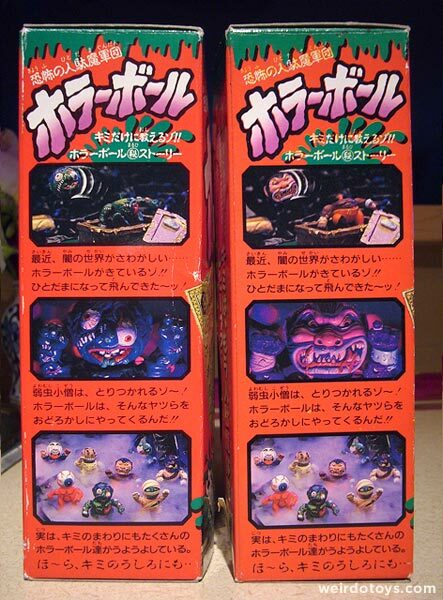 That ultra web-scouring I mentioned earlier brought me to a nice fellow toy-lover who somehow got a hold of these beautiful things (thanks for the photos Kelly. You’re the best). If anyone has any of these Japanese Madballs Head-Popping figures he’d like to get rid of (or any other photos to share), you better email me right now! Yep. it’s official. i hate you…BUT I’d hate you more if you had the Japanese packaging, so that’s a plus. Weirdo Toys prevails! 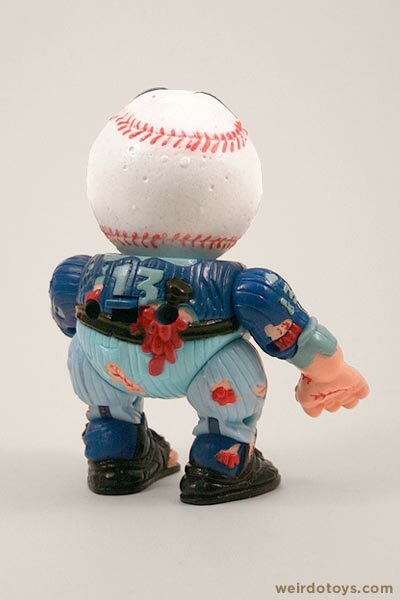 Welcome home, all members of the Madball family. Feel welcome and complete. WOW! That took serious time to obtain all of those toys! 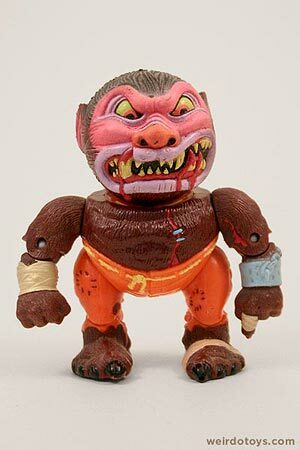 I still have several of these sitting around, they were some of my favorite toys from the 80s. 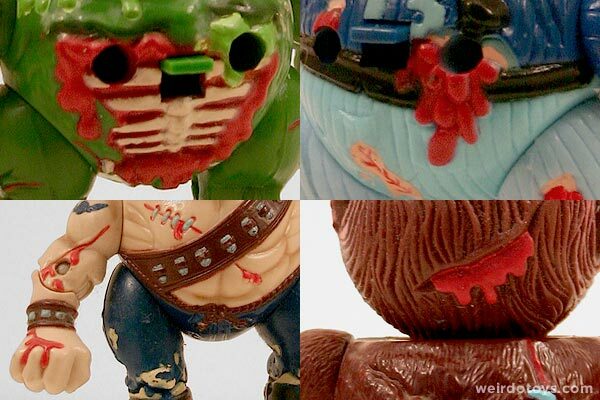 I will say if you are going to display them, don’t leave them with the heads “loaded”. Several times I was sleeping when one of them just decided to go off on my shelf, slamming into the shelf above it and knocking a bunch of stuff over. I think that just adds to their legacy though. Very nice! I definitely remember these, but I’m not sure if owned any of them. Horn Head and Bruise Brother seem the most familiar. @bradlby – “I think that just adds to their legacy though” Ha! Just imagining that scenario in the middle of the night cracks me up. That would definitely be a sucky wake-up call. 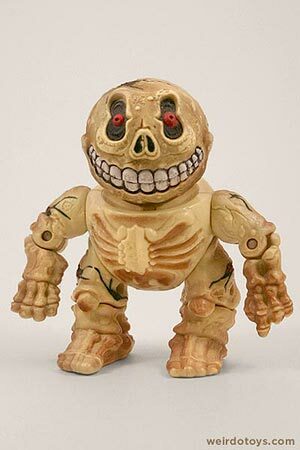 The head of my Skull Face figure pops off sometimes. I discovered that a little wad of paper or something can be wedged beneath the trigger to keep it in place, not allowing it to “fall down” to release the head. @ Matty – It take take a little while, but it wasn’t so bad. I was actually surprised by how quickly i had obtained them all. Awesome collection – and even more awesome to read the lengths you went to in order to obtain it all, especially the chopper. Ooh, I have Bruise Brother, Skull Face and Dust Brain. 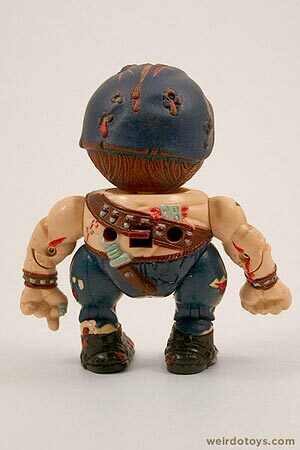 I loved Bruise Brother so much a littl’un that I glued his head on so that I wouldn’t lose it. Dust Brain’s head is really sticky for some reason, and Skull Face is just fine, but the least fun-looking of the three. I really like bruise brother! My god. I had thought I had come across all of the bits and pieces of my childhood that I’d forgotten. My pleasure, Jack. I was equally thrilled when I discovered these guys. I’m glad I have the opportunity to share it with you all. I was in a Target the other day, and to my surprise, they were selling a number of MadBalls birthday cards. i have wolf breath,slobulus,dust brain,lock lips,horn head oculus,and the mad rollercycle which is still in the box, pretty battered box though. i tryed them out today and some of the heads snapped the trigger mechanism`s be carefull!!!! how much are these guys worth??? 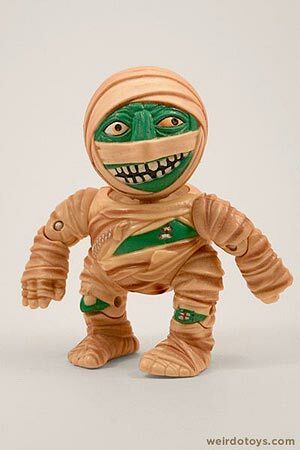 OH MAN i had most of these when I was young, absolutely loved them to bits especially ‘Dust Brain’ he was my fav if I remember correctly. This totally brings it all back thanks for sharing! Ah yes. 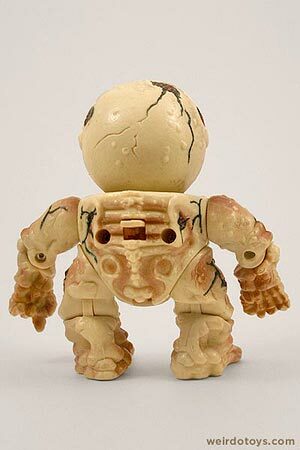 I still have Oculus Orbus. 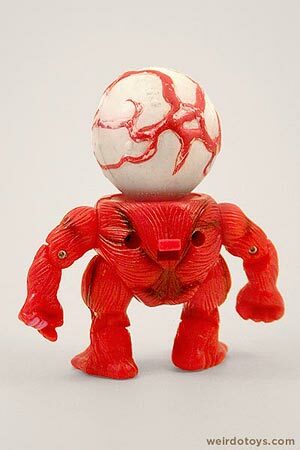 I never owned a “real” Madball as a kid, but found some at Toys’R Us on clearance so I had to get at least a couple! 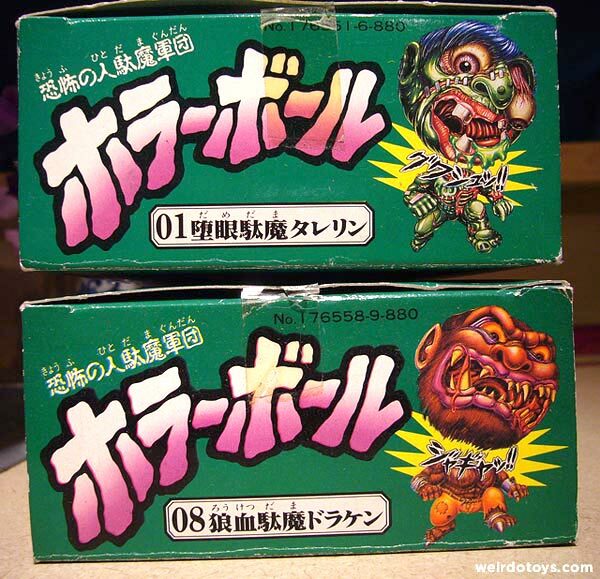 As for the Japanese HorrorBall figures? Amazing! The packaging is just beautiful. And I bet they are impossible to find. 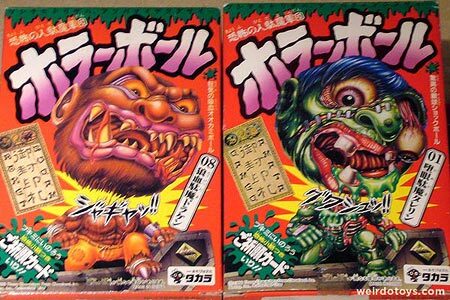 I’d love to get the Japanese equivalent of Oculus or Dust Brain. 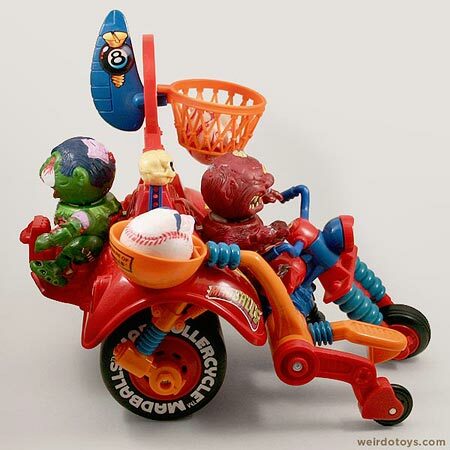 I had nearly all of these and my brother had the bike. The springs were pretty strong and the heads were solid I doubt they would be allowed to make anything that could smash glass (accidentally) as well as these things could. 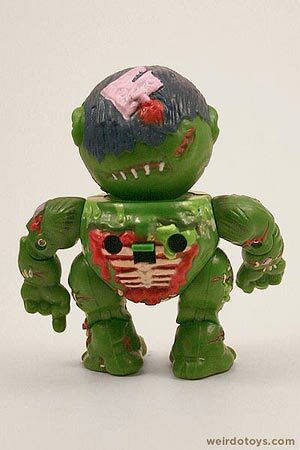 I bought one of these guys from a car boot about 20 years ago and lost the poor fella somewhere yearssssss ago. I only tracked down what they were today and have subsequently gone nuts on ebay. weirdotoys.com has filled in some serious gaps in my memories of being a kid. 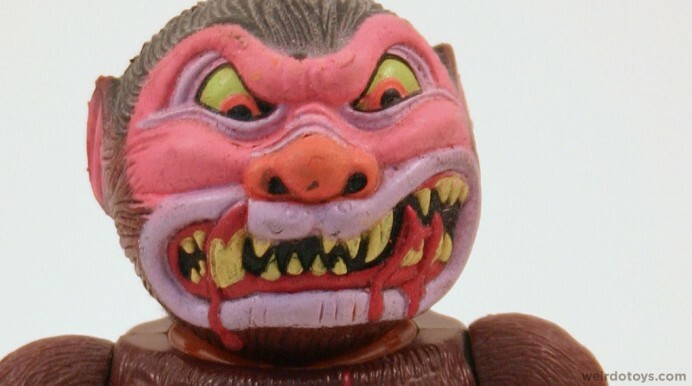 I had Slobulus as a kid. 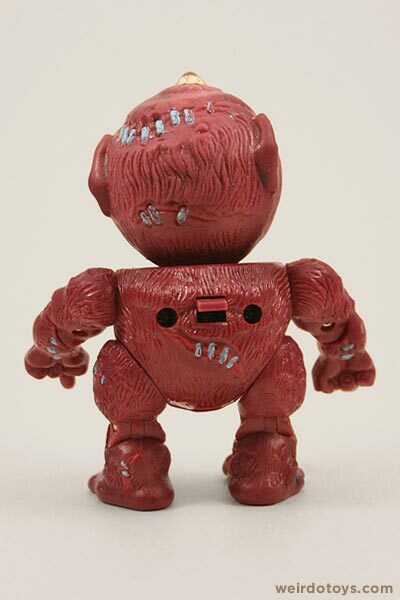 In fact, I just discovered the weird toys site looking for information on these guys. 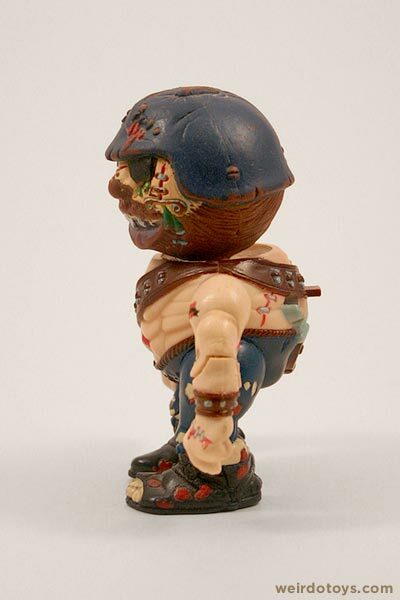 I’m probably selling my Mad Rollercycle including madballs action figures. Anyone interrested? But really enjoyed reading this little site you’ve put together! Cheers. I just scored Bruise Brother, I now have 5 of these, absolutely love them! 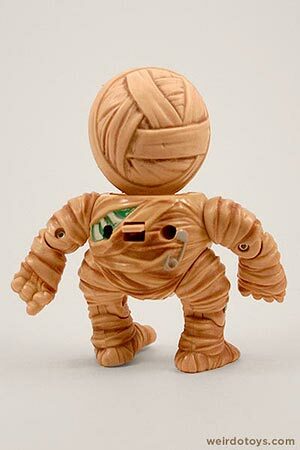 I think what people who don’t have any should know is how well they are made, how sturdy and heavy the bodies are, and how they actually have good articulation for such a strange toy. 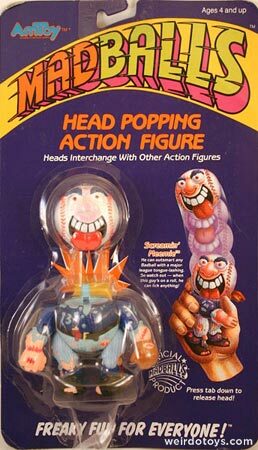 Also, the heads are rubber like the material a superball is made out of. Can’t wait to get the 4 I need to finish this line! What sort of price does these go for, I’m looking on eBay and the prices can vary quite a lot. Looking to pay £30 for Dust Brain, Wolf Breath and Skull Face. All are in good condition. I have all of them, except for the rollercycle with hornhead, I never couln´t find it. 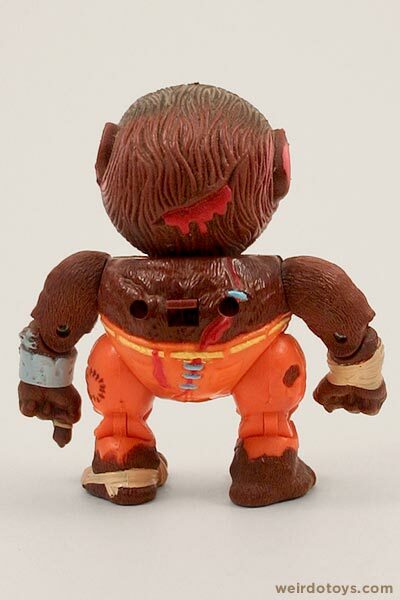 Great figures but easy to damage, especially the trigger mechanism. I used to have them all and the cycle used to love playing and looking at them cant remember which was my favourite the only thing I have left to remember them is Lock lips head sitting in a pot near me now.